A.O.D. Convertor is installed near to the furnace. The desired scrap will be melted down in the Furnaces. 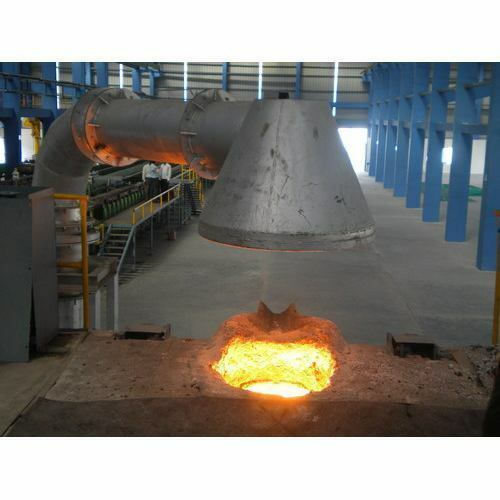 The molten metal at temperature of 1580°-1600°C will be transferred to the A.O.D. Convertor Vessel via over head crane to refind to the desired chemical composition by addition of required Alloys/Fluxes and use of various gases. The gases media such as Oxygen. Nitrogen, Argon & Compressed Air are injected into A.O.D. Convertor through High Blowing rate Tuyers along with oxygen Top lance for good mixing effect and excellent Heat efficiency. AOD,Argon Oxygen Decarburization, is a process for making stainless steel and other high grade alloys by allowing precise gas manipulation. Since stainless steels need to be further refined, oxygen, gradually replaced by argon, is blown through the molten steel to eliminate impurities. This refining process produces steel with low carbon properties (.01% or lower) and low silicon levels, which, in turn, creates a metal that has better weldability (can reduce weld electrode use by over 50%), and is more corrosion resistant, malleable, and heat resistant. AOD is increasingly used to improve alloy performance. Recycling of raw materials with guaranteed high purity. To meet the demand of our customers we also manufacture Argon Oxygen Decarburization Converter utilizing superior grade stainless steel and other basic components with the help of expert professionals. The raw materials are obtained from the most reliable vendors in the market. The product is duly quality checked prior to its introduction to the customer. These products are offered at most reasonable prices. Looking for “Argon Oxygen Decarburization Converter”?